Mondioring is an FCI-authorized international protection sport developed in the late 1980s by representatives from every major country with a protection sport. The "new" dog sport was designed to "level the playing ground" and allow competitors from any of the world's disciplines to compete in a common dog sport. French Ring, Belgian Ring, IPO (SchH) and KNPV all were represented. The result is a dog sport that combines the best of all of these sports: Mondioring. Like most protection sports, Mondioring has a series of exercises to be executed by the dog/handler team in the categories of obedience, agility (jumps) and protection. At the Mondioring III level, there are a total of 17 exercises, completed without interruption, and lasting approximately 45 minutes. An interesting possibility in Mondioring is that a dog that has titled in another protection sport—for example French Ring or Schutzhund—is allowed to enter Mondioring at the level that it has achieved in its own country. The obedience in Mondioring is based on functionality with an emphasis on control in spite of distraction. The jumps in Mondioring test the structure and willingness of the dog. 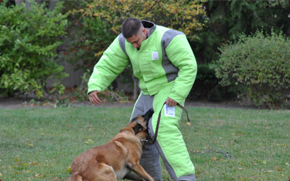 The protection phase of the competition requires the dog to demonstrate tremendous control. A Mondioring dog competes at each level without collar or leash throughout the trial, thus testing the control of the animal from the very beginning. The complexity of the trial field, combined with the demands of extreme control, combine to require that the dog be clear-headed with excellent character. Mondioring has grown steadily in the United States since the first trial in 2000. There are several full-member clubs and a variety of other clubs forming around the country. Trials are held regularly, and provide an opportunity to earn titles in this fascinating sport. Mondioring titles are recognized internationally. Each year, the organization in America, the USMRA, sends a team to compete in the International Championship of Mondioring in Europe. An interesting note is that international competition is quite "doable," as we are still a relatively small organization in a new sport. Mondioring is represented in this country by the United States Mondioring Association. This organization is a member of the American Working Dog Federation (AWDF).